Technically, what you see in my screenshot above is not really i3. The distance between the windows and the screen edges is from a fork of i3, dubbed i3-gaps, created by Ingo Bürk. Also, the bar is an alternative to i3bar, which I will go over later in the list of bars for i3. 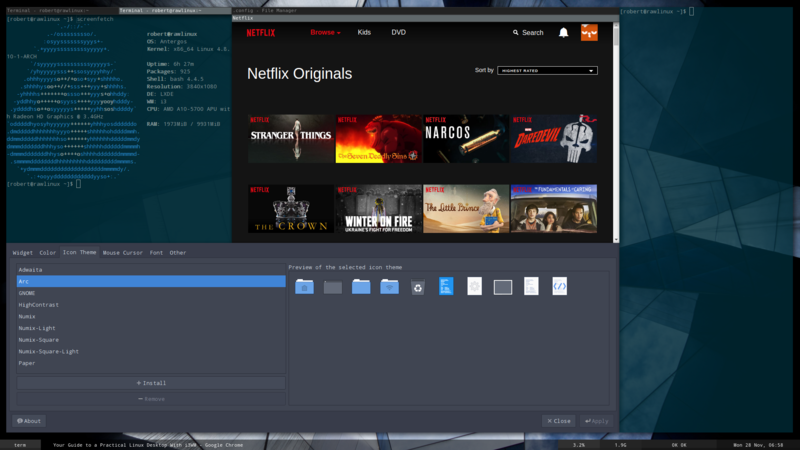 i3WM is not a traditional desktop environment, such as Unity or Gnome. Instead, it is only a window manager, and it's only purpose is to control the layout of your screen. i3 is not recommended for beginners to Linux, as all the configuration you do is in text files, with almost no gui. You have two major choices for configuration in i3. You can have the files in a dot folder (such as /home/user/.i3/) or in the .config folder (/home/user/.config/i3/). It does not really matter which you use, but in this guide I will be referring to the .config approach. If your distro is not listed, look it up. You should be able to find instructions easily. If you are using Arch, the easiest way to get to i3 is with a session manager. When you install i3, it gives you a choice of using the defaults or setting it up yourself. If you are a beginner, I recommend using the defaults, which includes a mod key of Alt. You use the mod key in several keyboard shortcuts, such as when you move windows or resize them. Here are the keyboard command to use i3. They might seem complicated and hard to use at first, but with time they become second nature. 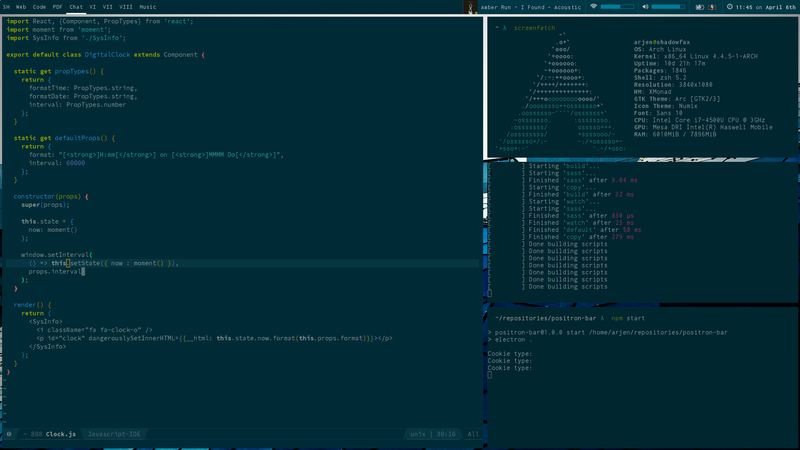 When I was using Ubuntu on my friends laptop, I found myself tapping Alt + Enter for a terminal. Remember, if you stuck with the defaults, Mod is Alt. This selects a window, kind of like Alt Tab. This moves the selected window. This floats the window. Move with Alt drag, resize with Alt right click drag. This enters resize mode. Resize using the arrow keys, exit with Enter. Another useful method to resize windows is Alt + right click drag. This sets the layout mode to horizontal. New windows tile left and right. This sets the layout mode to vertical. New windows tile up and down. This sets the layout mode to tabs. New windows are tabbed. This sets the layout mode to stacked. New windows are stacked. .config/i3/config is the file that controls the window manager. Here, you define startup applications, custom keyboard shortcuts, and layout rules. If you use i3bar, this is where you configure it. Place these at the end of the file (.config/i3/config). Exec means run command. You can change gtk settings with lxappearance. 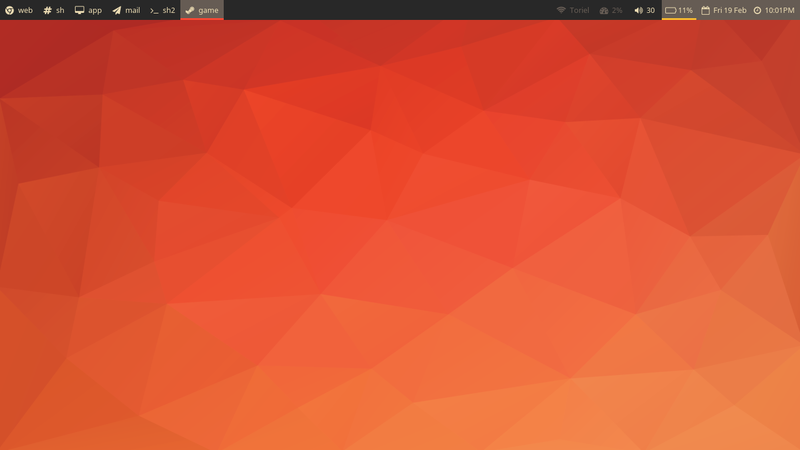 If you need to choose a theme, check out my article on the best linux themes. Bars are what you use to see info on your system, and in some cases launch apps and change settings. The default bar is i3bar with i3status, so that is not included here. If you want the same look as the screenshots, the files are linked. Lemonbar is very configurable and is probably the most popular solution, but has no clickable areas. To get this look, install lemonbar, and download the dots. This is my custom config for yabar, a simple bar from /u/geommer. Open the image in a new tab, because it looks small on the website. To get this config, install yabar and edit .config/yabar/yabar.conf with the contents of my gist. Xfce4 panel can be run on i3, and it looks pretty good. This is a good option if you want a GUI config. Positron bar is another alternative to i3bar, with the clickability that lemonbar and yabar lack. It is powered by Node.js and styled with css. Follow the instructions in the git repo to install it. Have fun with i3! You can do some pretty cool stuff with it.